Apologies for the blunt title. But the Blue Jays are taking too long to get shots off. They have an advantage compared to the average D1 team that they could be exploiting more. Let’s be clear about that, we aren’t suggesting that their offense is not playing well, as you’ll see below, they are well above average. But by distributing their shots earlier in possessions they could be generating more advantage from their skills. We became curious about this topic thanks to some LaxPower forum banter with some frustrated Blue Jays fans who want the team to play faster. The flip side of that opinion was also represented, with some folks worried that going faster for the sake of going faster will not yield any better results (and could be detrimental). Fortunately, we have some data that can help add some additional data points into the discussion. 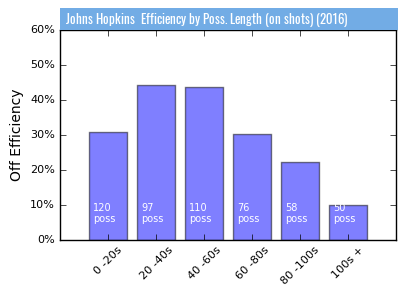 So we went back and looked at some of our pace/efficiency modeling so see if we could dig into Johns Hopkins in some more detail. (The pace/efficiency stats can be found here for each team). 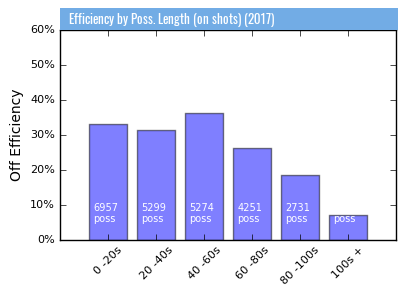 The rationale for looking at efficiency two ways was because a possession that doesn’t include a shot at all may or may not reflect a strategic pace decision. If you pick up a ground ball and fail to clear it, it’s probably going to be a short possession, which will impact our overall efficiency numbers, but shouldn’t be considered as it relates to judging the effectiveness of different speeds. For that reason, we have the last data set, which allows us to dig into possessions that include at least one shot, and therefore, include a conscious decision to shoot or not. There is a data gap here: possessions that result in a turnover, but which do include a decision not to shoot. In other words, a player was in position to shoot, but chose not to for whatever reason and that was followed by a turnover. Since we don’t have data on split-second decisions not to shoot, we effectively ignore these. That said, the amount of time it takes to get in a position to shoot is relatively consistent because you have a limited amount of time to get it in the box, so there is still enough variation here to make for a relevant analysis. 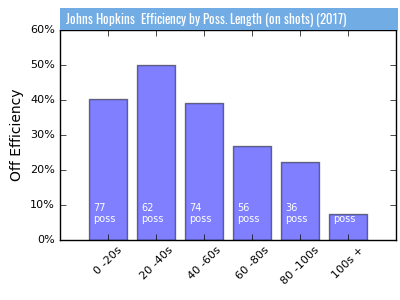 This much is clear, through, 11 games, Hopkins is most efficient on offense when their shots come between 20 and 40 seconds after gaining possession. 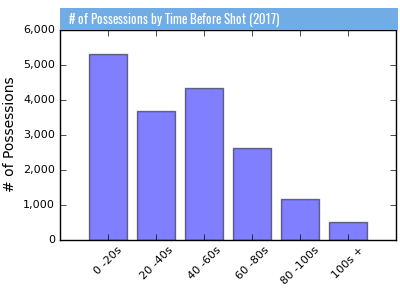 They score on roughly 50% of the possessions in which they get a shot off within this time range. If they shoot before 20 seconds or between 40 seconds and 60 seconds, efficiency drops to around 40%. Now all three of these rates are impressive when you consider that the average D1 team is between 32 and 36% for these three time buckets. So clearly, the Jays are playing efficient lacrosse (#8 in the nation in efficiency). You might argue that Hopkins offense is clicking just fine, so why on earth are we trying to change anything. Fair point, but I’ll point to a one-goal loss to Syracuse as an instance where one extra goal could have made a huge amount of difference. And in reality, there are probably a few goals that the Jays have left out on the field this year. This is because while they have an offense that is clearly capable of scoring early in possessions, they are playing like regular old Joe D1 Team. That’s no copy; the Blue Jays distribution of when they take their first shot in a possession is a virtual mirror image of the average D1 team. This is a Porsche idling in the drive through of a Wendy’s. 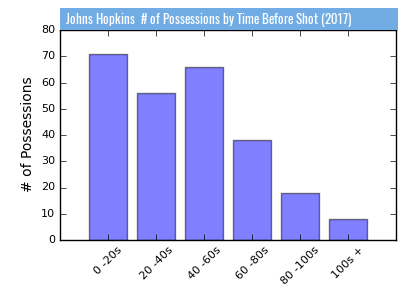 Hopkins has had 74 possessions this season where the first shot after gaining possession came between 40 and 60 seconds in. They’ve had 62 possessions where the first shot came between 20 and 40 seconds in. That is 15 possessions where they’ve essentially sacrificed 10 percentage points of efficiency. That works out to 1.5 expected goals left on the table. Round down for practicality’s sake if you want, but what if that one goal came in the Syracuse game? Sure, it’s 1.5 theoretical goals. But we are talking about a tactical change here, we aren’t suggesting that they rejigger their line up or magically get better at something. If you could take the brakes off an offense and potentially flip the outcome of a game here or there, wouldn’t you want to try? The ironic thing here is that the strategy that the Jays have been employing looks like the perfect strategy if they still had 2015’s team. 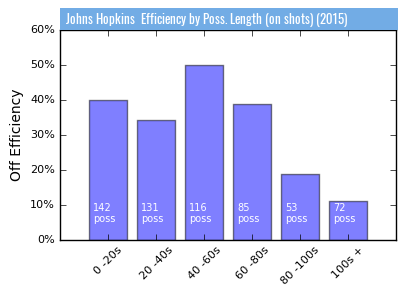 That group was most efficient on possessions where the first shot came between 40 and 60 seconds in. Which as we see above, is more consistent with the distribution of shots of the 2017 vintage. In fact, it’s been a evolutionary thing. In 2015, they were best on possessions after waiting 40 seconds. Last year, they were roughly even. This year, the quicker shots have become more profitable. I’ve watched a woefully small number of Blue Jays games this year, so fans of the team, please weigh in with your opinion, but it’s hard to see this steady progression and not think that this team is wasting some opportunities.